With NASA's space shuttle program officially at an end, the agency is making preparations to benefit the future of spaceflight, which includes ambitious plans for long-duration human missions to Mars or an asteroid. But to make these big missions happen, researchers are thinking small. So small, in fact, that they're focusing on the microscopic bacteria in our guts. What that means for astronauts is yet unknown, but ongoing experiments — including one that flew on a recent shuttle mission that looked at the gut bacteria of squid — aim to find out. "We're very concerned with the potential of increased infectious disease," on long-duration missions, said Cheryl Nickerson, a professor in the Center for Infectious Disease and Vaccinology at The Biodesign Institute at Arizona State University, who studies the effect of spaceflight on microbes. "They're living, if you will, in a tin can. It's a closed environmental system … It becomes very important for us to understand the microflora in our bodies, both the good and the bad ones." Decades of research on microbes in space has shown that bugs act odd in microgravity. Some grow extra-vigorously and some show reduced growth, Nickerson said. Others show changes in their shape or increased resistance to antibiotics. But no one had studied whether microgravity alters the ability of pathogenic, or disease-causing bacteria, to cause infection. 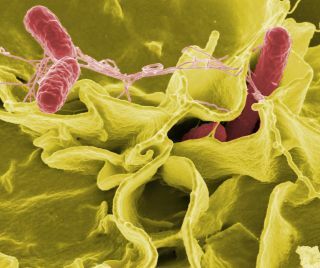 Nickerson and her colleagues sent Salmonella bacteria, which causes food poisoning, to the International Space Station aboard two shuttle flights in 2006 and 2008. They found that the bugs grown in space were three times more likely to get mice sick than Salmonella grown simultaneously in a control experiment on Earth. Spaceflight changed the way that Salmonella expressed its genes, the products of which are responsible for the increase in virulence. This increased virulence is particularly troubling given that astronauts' immune systems are not as strong in space, Nickerson said. A more recent study by Nickerson and her colleagues found that another bacteria, the respiratory bug Pseudomonas aeruginosa, shows similar space-related molecular genetic changes to Salmonella, but the researchers have not yet determined if P. auruginosa becomes more virulent in space. Space-faring microbes may help develop better vaccines for Earth-bound humans, Nickerson said. Right now, Nickerson and the director of the Center for Infectious Diseases and Vaccinology, Roy Curtiss, are working to improve the efficiency of a vaccine developed in Curtiss's laboratory. The vaccine fuses weakened Salmonella bacteria with molecules from Streptococcus pneumoniae, the bacteria that causes pneumonia. The hope, Nickerson said, is that the virulence-enhancing qualities of microgravity will give the weakened Salmonella staying power in the body so it can better induce an immune response to the S. pneumoniae molecules. This immune response would prime the body to fight off future pneumonia infections. The vaccine launched into space on the last ever shuttle mission – Atlantis' STS-135 flight – earlier this month. But astronauts will likely also benefit from space-microbe research. Extraterrestrial space microbes make for good science fiction, but the findings of Nickerson's team suggest that astronaut crewmembers may have more to fear from bugs they bring with them, said David Liskowsky, the director of Medical Policy and Ethics at NASA Headquarters in Washington, DC. And, keeping an eye on the "good" bacteria that populate our guts, mucous membranes and skin might be as important as knowing what bacteria are going to go bad in space. "Before you go, you'd want to get a census of the crew members and what species they have in their bodies," Liskowsky told SPACE.com. "During the mission, you can monitor that and see if there are any changes." NASA does not yet have guidelines on medical procedures for medical care on long-term missions, Liskowsky said. However, experiments are underway: space shuttle Endeavour, for example, launched to the International Space Station on its STS-134 mission on May 16 with baby squid on board. The goal was to see how bacteria colonize the guts of the squid to find out whether astronauts are likely to have problems with their own microbial colonies in space. Endeavour returned to Earth on June 1 after a 16-day mission to the space station. Meanwhile, Nickerson said, NASA needs to take microbes into consideration in many mission decisions, including what sort of onboard disinfectants to use to prevent microbial resistance. "We need to be prepared to be able, to the best of our ability, to effectively diagnose, treat and handle an infectious disease outbreak," Nickerson said.